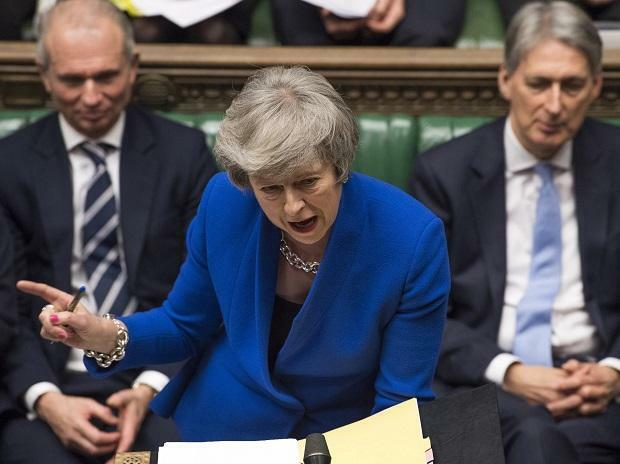 (File Photo) Britain's Prime Minister Theresa May speaks during a debate before a no-confidence vote on Theresa May raised by opposition Labour Party leader Jeremy Corbyn, in the House of Commons, London, Wednesday Jan. 16, 2019. As Theresa May tries to find a Brexit compromise that can get through the British Parliament, lawmakers are plotting to take control of the process away from her. May is due to give a statement to Parliament setting out her next steps. This is likely to be a document, accompanied by an oral statement in which she takes questions, starting around 3:30 p.m. London time. The same day, the government will publish a formal motion saying that Parliament has considered the statement. Then the fun begins. Expect a week of rival amendments being proposed and withdrawn, as May continues to seek a consensus. Parliament debates the January 21 motion. Usually, this debate would last 90 minutes, and a single amendment would be allowed. But the government is allowing a full day’s debate. There are also going to be attempts to allow multiple amendments, so that Parliament can vote on different Brexit options. One possibility that’s gained traction all the way up into the ranks of the Cabinet is to hold a series of non-binding or “indicative” votes in Parliament to test out support for different models of Brexit -- ranging from no-deal to a second referendum or Norway- and Canada-style deals. The idea is every MP could vote for as many options as they could support, and that would find the outcome with the most support. But that’s just the start. Former Attorney General Dominic Grieve is working on a plan to use an amendment in this debate to change the rules of the House of Commons so that control of the agenda is no longer in the government’s hands. This would allow a further, even more unprecedented move. A bill drafted by Tory former minister Nick Boles would take control of Brexit away from the government altogether. If Parliament can seize control of its own agenda, it can give itself time to debate and pass the Boles bill. That would give May until February 11 to get an alternative Brexit plan past Parliament. If she failed she would lose control of the process and senior legislators from all parties would be given until March 5 to try to find a deal that Parliament can pass. If they couldn’t manage that, then the government would be instructed to seek a delay to Brexit.